As you know, I paid a visit to the VET yesterday. The good news is my healthy lifestyle has paid off. I've lost 10% of my body weight over the past 5 months and the VET says I'm mere ounces away from my optimum and oh-so-svelte self. Part of my healthy lifestyle has included drinking more... water, that is. So today we're celebrating and the drinks are on me! Well, they're actually on the nice people at PetSafe, the manufacturer of my Drinkwell Pagoda Fountain. And since today is World Cat Day...what better time meet up for a drink. Glogirly bought my fountain earlier this year and later, had an opportunity to meet the PetSafe man at BlogPaws. She contacted him a few weeks ago and asked if he might want to give one of our GLOGIRLY readers a Pagoda Fountain of their very own! Glogirly calls our fountain the Peacekeeper. It's the only place in the Townhouse where Waffles and I call it a truce. There's never any fighting or hissing when we belly up to the bar. The fountain plugs into a standard electrical outlet and runs continuously, creating a very zen-like atmosphere with the sound of gentle, streaming water. Glogirly *claims* I'm kind of a skittish kitty, but from the first time she turned it on, the sound didn't scare me at all. Glogirly cleans it once a week. That's what the fountain people recommend. It has very few pieces and is easy to take apart. She rinses the pump each time she cleans it too so that it doesn't get any hard water build up. ♥ It's ceramic porcelain design is more hygienic, makes cleaning easy and looks modern and beautiful in the Townhouse. 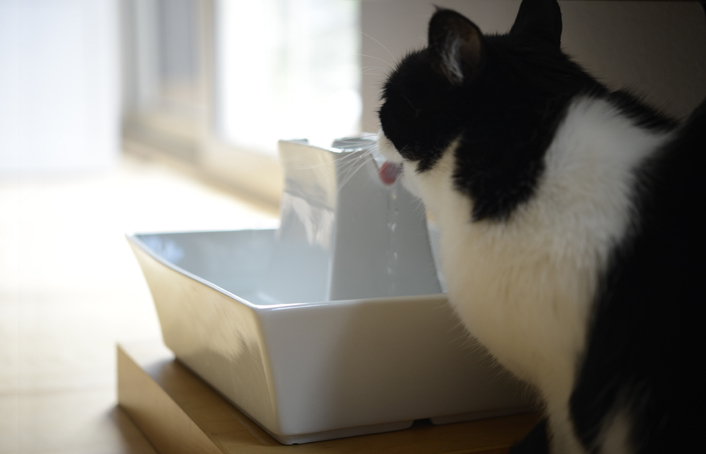 ♥ The free-falling water streams add oxygen for freshness and make it more enticing for us kitties to drink more. ♥ The low-voltage 12V system has a submersible pump for safe and quiet operation. ♥ A replaceable charcoal filter keeps the water fresh and odor free. ♥ The fountain holds a whopping 70 ounces of water. ♥ Did we say it LOOKS really cool? This is a PAWSOME giveaway. The fountain retails at $99.95. We apologize but the giveaway is only available to US and Canada kitties... and dogs. But you international cats can enter to *gift* the fountain to a friend or shelter! 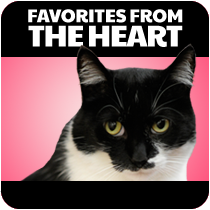 ♥ Leave a comment telling us about your kitty you think will enjoy the fountain the most. 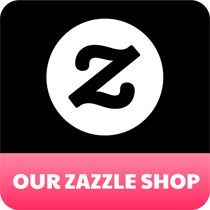 ♥ Make doubly-sure we have your email. ♥ Like PetSafe on Facebook. ♥ Please leave a separate comment for each extra entry earned. Deadline to enter is Tuesday, August 13 at 11:59pm EST. Winner will be chosen via Random.org and notified via email. Winner will have 48 hours to respond with mailing address. FTC Disclosure: We were not compensated for this review & giveaway. We purchased our own Pagoda Fountain and loved it so much that we asked PetSafe if they would provide a fountain free of charge as a giveaway to one of our readers. Oooo Oooo We're first to concatulate you on your righteous new bod! We'd wolf whistle, but, you know, fur. Princeton would LOVE to drink from the top and play in the bottom of the fountain. Great giveaway! We already "liked" you and we "liked" PetSafe on FB. Both of us would love that fountain because we could both drink from the water flow at the same time! Of course, Brulee likes to play in the water, but that's beside the point. I'm thinking this would really keep Sherpa from A.) drinking from and B.) flipping his toys in the toilet. Which is freakin' annoying if you know what I mean. I like the PetSafe FB page. I like Glogirly on FB. My Teddy loves his fresh water; he'd be very pleased with this! With 4 cats a big watering spot would rock our world! I think this is the EXACT pet fountain I have wish-listed on Amazon! Holly and Figaro would love to have more zen in their lives! Holly is a little on the chubby side, too, so she needs some help to shed a little weight. I like PetSafe on Facebook. I already like Glogirly and PetSafe on Facebook. Ooh, love the design, we think it's very classy. The purries of Purrchance To Dream would love to drink out of that! Our fountain died. Again. We could really use another one! Carmine's condition (FLUTD) requires he drink lots of water. I think this would be a great way to encourage him even more to drink more than he already does. :) He comes to the sink when it's on, so I think he'd really enjoy it! 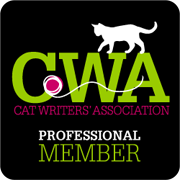 We liked PetSafe on Facebook. We shared your giveaway post on our Facebook page (Fur Everywhere). We are pretty sure you have our e-mail, but if not, it's fureverywhere [at] gmail [dot] com. Vashti & Jonah would like it the best. We'll do other entries later. We're kittipooeb@yahoo.com. Concats on your weight loss, Katie! We think we'd love to have it so we can drink at the same time from it. Even though we have multiple bowls, we get in line for the one in the bedroom... literally. 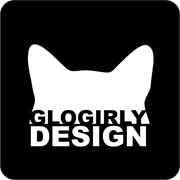 We thought we already liked Glogirly on FB... we do now! Fountains are great and this new design looks pawesome, no more having to wait your turn. The mom has been wanting to get us a new fountain since the one we have isn't working right. And she's been looking at this one in particular! So we wanna win it!! Please!! 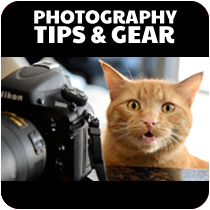 We like Pet Safe on Facebook! The mom does too. That's so good, Katie. Stay healthy sweetheart! The fountain looks very cool and if I won I''d bring it to the PAWS shelter because I recently bought one for my cats. We love it! especially since it is so stylish and zen looking. We need some zen in this house. Harry wakes mom up each morning crying for his fresh water from the bathroom tap. He even wakes up our human special needs sister with his whining. That's when mom wants to make him President of another country. Thanks! Beautiful fountain! I'm gearing up to getting a new kitty so this would be fantastic! Already like Glogirly on FB. Hi Katie and Waffles! And Glogirly! Katie, congratulations on your awesome work getting the extra fluff off!!!! :D Stupendous Rainy is also working hard to turn her fluff into muscle. Have you thought about Crossfit? Commandant Paco and his mission partners would LOVE the Petsafe Pagoda. 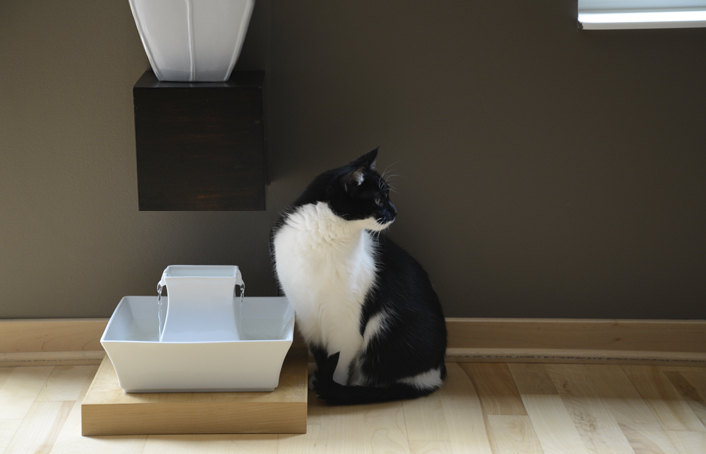 Here at Casa de Tribe Atherton, we are BIG fans of Petsafe products--the automatic litter box is a life saver!!!! Mama Julie runs around constantly refilling water glasses because we are super picky about the freshness of our water, and if we had the pagoda, she could spend her new free time making us proper cat walks and teaching the dogs new manners!! Please, please, please pick us!!!!! We love you!!!! We shared this post on FB! Hmmm... I think I, Nerissa, would like it A LOT but perhaps my brother Seville would like it even more. Remember he had those pee-pee problems before? To keep 'em from comin' back, one of the things he has to do is drink LOTS of water. So I'm goin' with Seville. Seville would like it the most. You are looking wonderfur Katie. Dad may put some of us on a, um, better diet. I would love a fountain! HAPPY WORLD CAT DAY and good luck to those who enter! Cody isn't big on fountains so we aren't entering but we WILL share this! My new kitty, Lowenstein, needs a fountain of his own. Right now he's drinking out of a bowl. A fountain would be so much better! Sleek Divine Miss K! High^ paw for the healthy bod! I can just see you strutting in a bikini now! Anything that will help BratCat dink more water, thus keeping his kidnets in better shape during his *spells* well, I'm all for it! BTW in that first pic you can REALLY tell you've lost weight. Concats my furriend! The Crew really could use a second fountain..
can't pin it since pinterest is down at the moment but I shared on google+ if that matters..
That pagoda fountain looks really cool! Mommy is very sure Tutu will be most fascinated by it. And splash the water all over the place. MOL. Congratulations on being so close to your ideal weight, Katie! Woohoo! Oh coolies! I think Star would love a fountain because she's always trying to drink from the sink! Please enter us! We like you on facebook! OMC!! Everyone wants this fountain! We do too! Before Wilbur and Louie came here, we had a plastic thing. It was ugly. Both Skootch and Lucy ignored it. Mom hated cleaning it (it was impossible to clean). Now, since Skottch needs to drink more [and hates the youngsters], maybe, just maybe this would bring a zen-like calm to the warring factions (look how effective it was for Katie and Waffles). Plus, Mom likes the way it looks and it's NOT plastic!! I would like this fountain, Mommy would like the water fall, but please, please, Random thingie, you should make sure someone very very deserving should get this! Haven't we liked you on FB? I will make sure that Mommy does!! I think all my cats would love but; my oldest cat would benefit the most as he loves to drink out of the sink and it's getting harder for him. Thanks for the giveaway. Glad Katie have great vet visit. Happy World Cat Day! Alreadt likee GLOGIRLY on Facebook. Oh my CAT, this is our VERY most FAVE fountain! 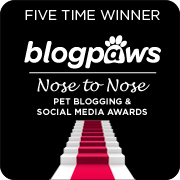 We won it at BlogPaws, and it's the third Drinkwell fountain we've owned -- and BY FAR the best and easiest to clean! We can't say enough good stuff about this thing! Ooh, my cats love their current 'platinum' fountain - but I might love having something more easily cleaned than the plastic. Well, that is really awesome about your weight loss, Katie. That was hard work, we are sure, so congratulations. Your fountain looks wonderful. Mom knows we don't really drink enough water, even adds water to Audrey's food just to get her some more, because she has had a couple of UTI's. She hopes we would both drink more from a water fountain like yours. We think Raz would love this fountain. We would all love the flowing water. We already Like you on FB! We Like Pet Safe on FB. We shared on our Florida Furkids FB page! We are happy to hear about Katie's weight loss!! We think Benny would most like the fountain. He's always nosing around when we refill the water bowl. OMC! I'd like to see if I'd drink outta that! Wonder how long it would last before TW broke it while she was washing it. Tell me the truth, you don't really wash it every week, do you? I like Glogirly on FB. BTW, did I miss the post where you gave the winner of the toys? We would love to win this fountain. There are four of us in the house and we love moving water. And it's good for us! 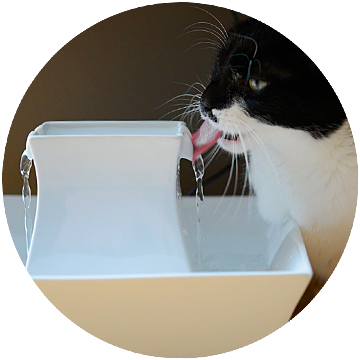 Our 4 cats would love this fountain because they would love drinking out of ceramic rather than plastic. First off I would like to say congratulations on losing weight!!! I would love to have one of these fountains as I have been trying to find a ceramic one because I heard they are healthier. You see, I love my cat Shadow as if I gave birth to him. When he came into my life on March 1st, 2006, my world was a dark and scary place. I was suffering from a deep depression, and severe OCD. it was also the first time I was living on my own and supporting myself. I was very close to never leaving the house again. When he was born under my ex's mother's porch that day, something told me I had to have him. She took him in at 2 days old and raised him until he was about 8 weeks old, when he finally came to live with me. Let me tell you, the sun started shining again! Here was this little guy who loved me no matter what, the true meaning of unconditional love. He cried at the door every morning when I left for work and was waiting there for me when I got home. He gave my life purpose, a reason to get up in the morning and keep going. If it weren't for him, I dont know where I would be. I don't see him as just a cat, he is a furry angel that was sent to me in my time of need and he saved my life. He suffers from luxating patella, mega colon, and has lost all of the teeth on one side of his mouth. Anything I can do to improve his quality of life, I will. 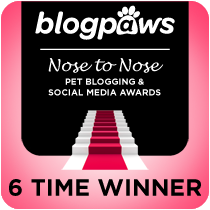 I have already liked glogirly on facebook, and I am going to like petsafe and share this contest right now! 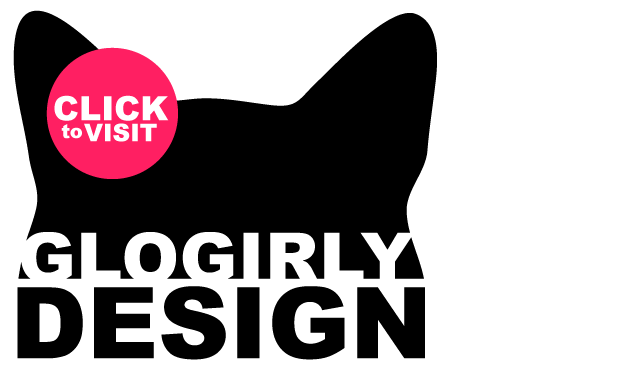 Liked glogirly and katie on Facebook! Katie so glad you almost met your goal in the weight loss. Just keep on drinking lots of water and you'll reach it in no time. 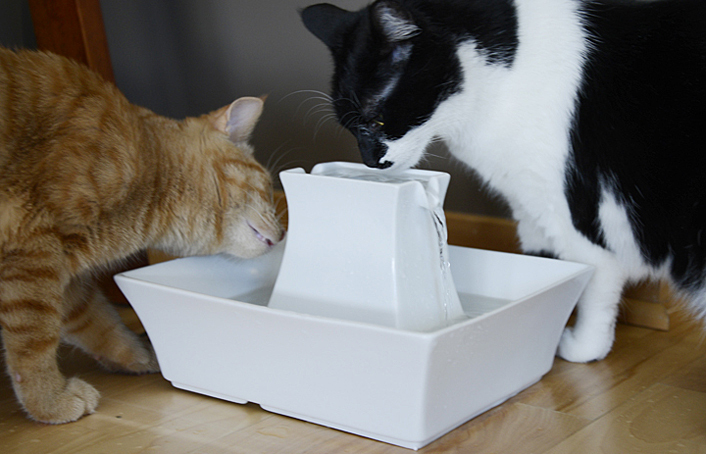 I'd love to win this water fountain, that way both the kitties could drink at the same time. But, I think I'll still have catnip mousies left in the water bowls in the morning. These fountains are really fashionable looking. Shared the contest with my friends! Please can you enter me and if I win I can donate it to a shelter in the US. I have liked Petsafe on FB and already like Glogirly. I like Glogirly on Facebook! Liked PetSafe on Facebook too! We like GloGirly on Facebook. And we tweeted it too!! My cat Luna would love this...he is all about the dripping faucet in the bathtub...and always there right after someone takes a shower to get some good water lickins. Oh...and my e-mail address is flowergoddess412@hotmail.com. THANKS! My little spit fire Persistence (Sis for short) was a determined little stray cat who jumped on my moving van the day I moved to town and wouldn't get off, so now I have a cat. The dog wasn't thrilled, but they've gotten used to each other and all is pretty much well around here now. She would love a new kitty fountain, because her current favorite drinking spot is the bathroom sink, and that's a hit or miss thing for her now. I hope she wins! That is a fabulous giveaway Katie. Right now drinking is extra important for me too with all the conditions I have. I want water, so that isn't too big of a problem. But that is one cool tall drink of water there! I am very proud of you Katie!!!!! Wow so much prettier than the plastic ones of the past. My 4 kitties could gather around and have a fountain party. Woo hoo! A battle free zone! We'd like to be entered. We love running water and we think Oui Oui would have a hard time tipping that fountain over. She used to sit on the side of the water bowls and tip them over. We went to the water fountain style so we wouldn't die of thirst, but they are SO boring! Thanks, Katie! Congratulations on getting so close to your ideal weight, Katie. That's a cute fountain. I have 4 cats that would love this fountain. They already share a Drinkwell Platinum fountain & this would be a wonderful addition. All my cats love to drink from the running water - Desiree, Clarisse, Isis & Lazarus love fresh water. Drinkwell makes the best fountains & their mom would certainly love such a neat looking one as this. I have liked GLOGIRLY on Facebook. 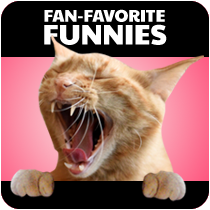 I have liked PetSafe on Facebook. I have shared the giveaway post on Facebook. 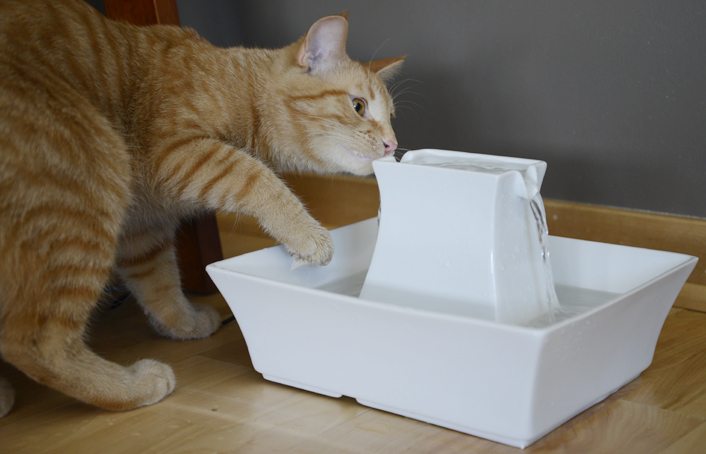 Your waterfountain is really cool looking ! Since me live in Sweden , I would like to give my ticket to a shelter that you choice. Wow that looks great! My 3 babies would love it! I hope you can stop dieting now that you are at such a good weight! I love the water fountain. 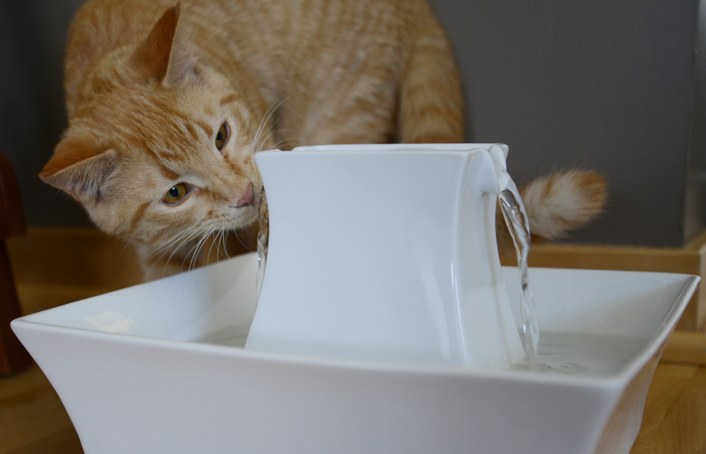 Now that Alice is a member of our household and she loves running water (and drinking water), I would love to win such a bautiful fountain! Thank you for the opportunity. I am at askfisher at gmail dot com. OMC! What a cool drink fountain! We would love to win one. And I like you on Facebook. Heck, I just like you. You can keep Waffles though. He looks too much like our orange menace. I like it a lot but I'm wondering if it is too small for my big dogs. Pinned the photo of Katie and Waffles drinking from the fountain onto my Pinterest account at NatureByDawn. We Like Glogirly on Facebook! We Like PetSafe on Facebook! Leonardo would love this because, truth be told, he doesn't quite comprehend water in a bowl. I have to pour some in while he's paying attention so that he knows what it is and will drink some. This is every single day mind you. I shared on Facebook as Margot Core. I like GLOGIRLY on Facebook as Margot Core. 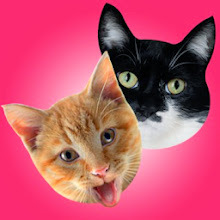 I like PetSafe on Facebook as Margot Core. 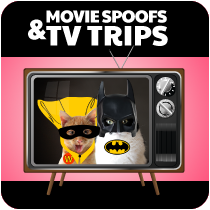 we tweetied, shared, already love you and liked PetSafe! Whew, we're exhausted! This fountain is fantastic! I love that the flow isn't gushing and overwhelming. Simon, my most sickly FIV+ boy, was back for another long visit at the Vet today. Even though he eats only wet food, I need to get him drinking more water. He just LOVES watching our Koi pond through the screened porch window, and he's also a bit obsessed with rain. I really think that he would take to this fountain quite well! If we can avoid some V E T appointments for this "blue dot" kitty, I would be ecstatic! Note: I don't know whether or not you'll be able to see it(privacy settings), but I can screen print the post if need be. OH, forgot to say... Katie... looking FABULOUS!!!! I have a long term foster kitty that needs to follow your plan! Kudos to Katie! You're looking good sweet girl! The fountain is so pretty, I'd use it for feng shui. We follow you on Twitter. Is the contest still open? I pinned it. Did I tell you I like you on FB. Okay, Waffles: we are entering this drawing. Z Girl will come back and let you know all the social media stuff as she handles them for us. Of the 5 Squeedunk Cats, Manhattan will like this fountain the best. We have two already, one is ready to be replaced. Manhattan loves to watch the water fall and then drink. For her it is a muli-media experience. The sound, the sight and then the taste. If she could, she likely would Tweet every time she stopped by for a few laps of refreshing drink. Coco will enjoy it as well, she does like both fountains; a nice white one would fit in with our apartment decor oh, so nicely!